Someday Productions LLC and Pillow Talking blog are pleased to present the following review of BROOKLYN. 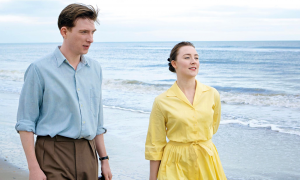 It was movie night and with a pile of DVDs to watch including numerous award-nominated films, it was Wayne’s choice – and chick-flicks be damned, he pushed hard for Brooklyn, the film adapted by Nick Hornby from the Colm Tóibín novel. He’s not necessarily not a fan of the genre, but he’s not usually all over it either. This time his motivation wasn’t the story itself, or even the lead actress Saoirse Ronan, it was because Domhnall Gleeson (from one of our mutual favorite chick-flick films, About Time and the amazing, The Revenant) was in it. I didn’t know much about the story, but hey, I’m a chick, so I was game. I’m also half Irish and always have yearned to visit Ireland, a dream I hope to realize someday soon. 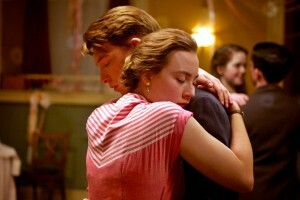 Brooklyn is a visually stunning film. Through thoughtful direction by Jim Crowley, period costumes, brilliant cinematography, and stellar acting, you feel as if you are transported back to the 1950s across two continents as you follow Eilis Lacey (Saoirse Ronan) in her journey from the small town of Enniscorthy in southeast Ireland, which she has outgrown, to Brooklyn, NY where she has hopes for a bigger, better life. Seasickness turns to homesickness and Eilis’ transition is difficult. She tells Father Flood (Jim Broadbent), the priest with a soft-spot for her angst, “I wish that I could stop feeling that I want to be an Irish girl in Ireland.” With no true friends, exasperating occupants at her boarding house, a job for which she appears ill-suited, and her dear sister and widowed mother still in Ireland, Eilis’ days seem to be an unhappy blur. The early pace of the film is measured as it mirrors her palpable despondency. When Father Flood enrolls her in bookkeeping classes, for a moment, she seems to brighten ever so slightly with this new opportunity. That is, until Italian-American plumber Tony Fiorello (Emory Cohen) invites her for a whirl around the floor at a community dance. Once she meets Tony, her entire world comes alive with color. Like Dorothy’s first steps into the Land of Oz, she becomes vibrant and spirited as she embraces New York hand-in-hand with Tony. Their romance is pure joy to watch. It does take some time for real conflict to unfold in the film – Eilis is called back to Ireland to deal with family matters and everyone seems to be in cahoots to keep her there. She meets the very eligible Jim Farrell (Domhnall Gleeson) and it would appear her head may be turned. Ultimately she must decide where her heart lies — in the town she thought she’d left behind or in the new land she only had just begun to embrace. The charming love story embedded within a historical drama is not a new concept. 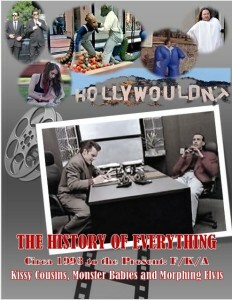 The performances, however, are authentic and the characters are three-dimensional. 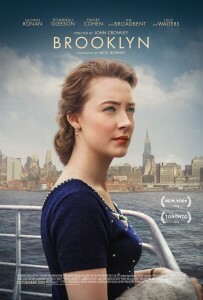 Saoirse Ronan captivatingly delivers. Bringing even more color to the screen are Eilis’ doting sister, Rose (Fiona Glascott), her weary and wearing mother Mary (Jane Brennan), the often humorous and sharp-tongued Mrs. Keogh (Julie Walters), the horrid shop owner Miss Kelly (Brid Brennan), and Tony’s outspoken young brother, Frankie (James DiGiacomo), among others. Definitely a movie for a girls’ night. Wayne had ants in his pants and got up from the couch more than once. At least he let me watch it in peace – he’s prone to commentating through many action films but this one kept him quiet. Let’s be clear. Brooklyn is a chick flick. 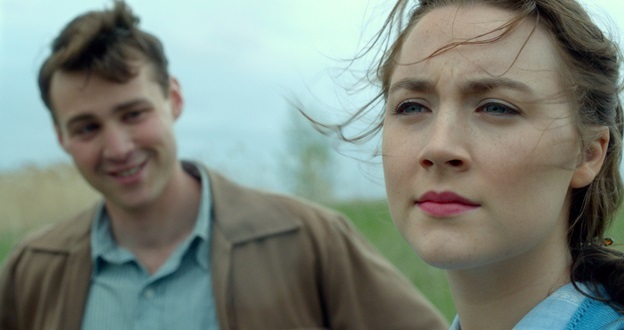 For a B-Horror/schlock/escapist fan like myself, I have to be in the mood to watch a film like Brooklyn. Don’t get me wrong, I can chit-chat with the best of the film snobs at cocktail parties espousing platitudes about films like The Tree of Wooden Clogs and Ingmar Bergman’s Scenes from a Marriage. I even liked The Notebook. So it wasn’t really surprising when I actually pushed by wife and my step-daughter to watch Brooklyn. My ulterior motive was that I have a man crush on Domhnall Gleeson. I believe he and Eddie Redmayne are two of the finest actors we have today. Brooklyn started off VERY slow. Gleeson was nowhere in sight and I found myself with acute heinie itch fairly quickly – never a good sign when watching a movie. But fortunately the story picked up and eventually Gleeson did appear. The film was predictably pleasant; a coming of age story about a young woman determined to break the ties to her local Irish community and risk the unknown challenges of a different country and a different way of life. The acting was superb. It was Saoirse Ronan’s tour de force from beginning to end. She pulled off a Pygmalion transformation with incredible subtlety and verve. 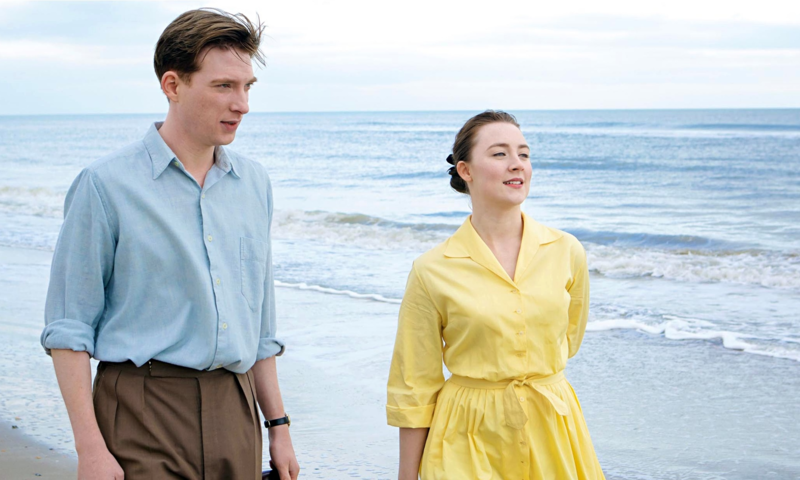 Emory Cohen (who is the man of a thousand looks – you’ll knowwhat I mean if you google him) was perfect as the Italian kid from Brooklyn who had a thing for Irish girls and the Brooklyn Dodgers (did I mention that it’s a 1952 period piece?) Domhnall Gleeson, as a potential love interest, didn’t disappoint, proving once again that he has an incredible range as an actor (I’m still reeling from his portrayal in The Revenant). Veteran actor and Academy Award-winner Jim Broadbent was so good as Father Flood, he made me want to confess my sins to him. 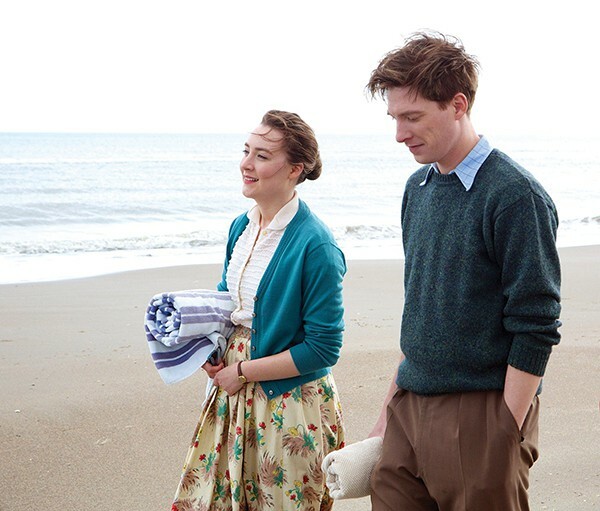 Brooklyn was based on the novel by Colm Tóibín and adapted by screenwriter Nick Hornby. 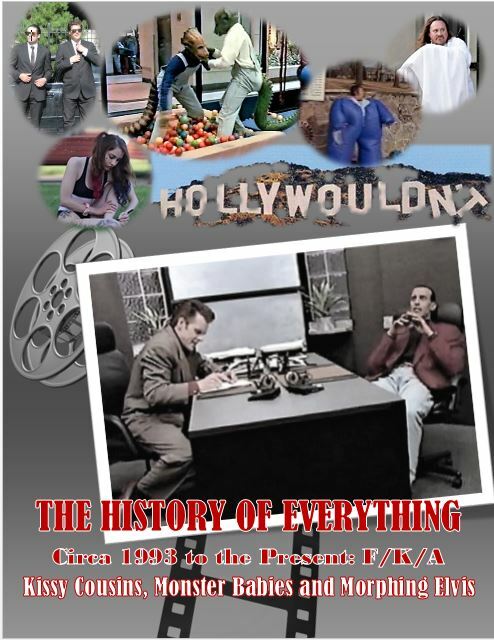 It was very capably directed by John Crowley. Overall, Brooklyn was an engaging and enjoyable experience.